Whether the minimum price has been activate or not, producer organizations are always paid a Fairtrade premium this is a mandatory amount above the cost of the goods that producers themselves make a decision how to spend, according to their needs. The premium is most often invested in farm improvements to increase yield and excellence, processing facilities to increase income, and teaching and healthcare projects. The use of the Fairtrade premium is decided democratically. Members of producer organizations formed of small scale farmers decide in their general assembly meeting. On a farm or farm using hired labour, a democratically selected Joint Body made up of management and a majority of selected worker legislature decides how to use the premium. The premium can only be used for the social and economic advantage of the workers, their families and communities, not for company owners. 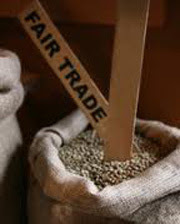 Producers jointly own and manage Fairtrade Labeling Organizations International, the global body for Fairtrade. They are representing on the Board of Directors. Through the Board and its committees, producers are involved in decisions on overall policy and setting prices, premiums and standards. Since Fair trades beginnings in the 1980s and the launch of the present FAIRTRADE Mark in 2002, Fairtrade has become the most widely recognized ethical label in the world. Sales of Fairtrade certified products have been growing at an average of 40% per year over the last 5 years. Fairtrade has achieved extremely strong market share in certain markets, including 53% of bananas in Switzerland and 22% of ground coffee in the UK. There are now over 10,000 Fairtrade products sold in over 70 countries. Sales of Fairtrade products are currently taking off in new markets including Eastern Europe and South Africa. FLO CERT, the independent certification body for Fairtrade is the only ISO 65 accredited ethical certification scheme. Three out of 4 consumers believe independent certification is the best way to verify a product’s ethical claims.